Home: GPS Tracking Benefits: Fleet Management FAQs: How to select a vehicle tracking system for an enterprise business? Vehicle tracking solutions come in all shapes and price ranges, but not all are ruggedised or built to support enterprise-level operations. Before you begin your selection process, consider the many areas where a vehicle tracking system can support your business and help it grow to levels you have never seen before. 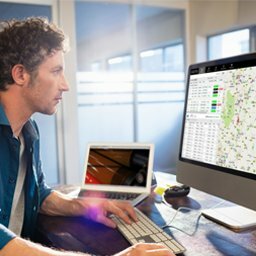 Outline your main business objectives to help define what you want and need from vehicle tracking software. Do you want to reduce risk and increase safety? Is cutting fuel costs a concern? Will it drive your team’s productivity up? Assessing these areas is a great start in your decision-making process. Choose a vehicle tracking software that is flexible and moves along with your team’s growth and changes––planned or unplanned––supporting you every step of the way regardless of the direction your fleet is headed. Don’t forget to involve other stakeholders in the process. Demo and test vehicles tracking systems together to see which best fits your company’s overall goals. Most vehicle tracking providers can give you a comprehensive look at how vehicle tracking works and how your company can benefit based on the size and needs of your fleet. When purchasing a vehicle tracking solution, understand the technology behind it. How can it keep you competitive in this evolving technological race where embracing digital transformation is key? For example, if your operation is on a smaller scale and you’re seeing it grow quickly, you’ll want to learn about business intelligence and how big data can turn your operation inside out for smarter planning. The right provider can help identify your team’s current and future technological needs and provide the solutions that can scale to meet the vision of your organisation. Often, implementation downtime can be lengthy. The average implementation time can take anywhere from one to five months on average. Choose a solution that offers professional services that will work with you to create a realistic plan and help alleviate any challenges or concerns you may have during implementation. Other available options should include on-demand training and local customer support. The last thing you want to do is roll out a vehicle tracking solution and support it on your own. The vehicle tracking software you select should not only focus on developing new features, it should support the existing product with the same level of integrity it puts out fresh ones. You want your vehicle tracking provider to have a core system with a solid tech infrastructure to support enterprise data volume and accessibility requirements as your fleet grows. This ensures your data is safe post any type of system outage or breach. If the provider isn’t prioritising application or software resilience, look for one that does and has its customers’ best interest in mind. Cyber crime is no joke. Providers who understand this ensure the integrity of the data they host and provide is protected. Look for a vehicle tracking provider that has established security measures, such as authentication methods, encryptions, and meets compliance, to prevent the wrong people from accessing your business information. Ask providers how they handle your data and get insight into their privacy policies. You want a provider who has a plan to keep your business safe and running without worry on your part. Take smartphone shopping for example. When looking to buy, you want a device that’s easy to use and hold for your everyday needs. The more complex, the more time it takes to accomplish a task or play that favorite game you enjoy so much. The same lense should be used when purchasing a vehicle tracking solution. Find one that optimises your work life and is easy for your employees to use - from anyone at the office to your drivers in the field. If you want two-way communication or compliance solutions, find a provider that offers a robust in-vehicle device that your new or veteran drivers can use and store freely in their cabs without issue. The simpler the interface, the better the results on the road and in your ROI. Earlier, we discussed the importance of a vehicle tracking solution that scales. A provider that offers this plus enterprise-level integrations enables you to plan beyond fleet management and vehicle tracking. With integrations and an open API, you can integrate your system with other comprehensive software or build on what you already have to create a super fleet management solution customised to fit your needs.